A new report suggests that former Michigan Gov. Jennifer Granholm would have been a top candidate for secretary of education in Hillary Clinton’s cabinet had the Democratic nominee won the presidential election. Mike Allen of the recently launched news site Axios reported on Tuesday that Clinton had prepared her “ghost cabinet” list before Election Day. Granholm also was listed as the second choice for attorney general if sitting Attorney General Loretta Lynch were not retained by a Clinton administration. John Sexton, former president of New York University and former board member of the Federal Reserve, was listed second as a choice for education secretary. As governor of Michigan, Granholm signed the state’s law that responded to the federal “Race to the Top” law in 2010. The Michigan law required school districts to give merit pay to successful teachers. 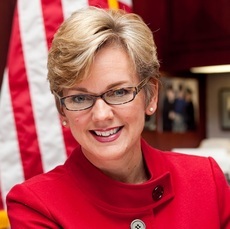 Granholm was governor when the Great Recession reduced state funding for schools, but federal funding temporarily grew at an unprecedented rate under the federal government’s stimulus spending. After leaving office in 2011, Granholm became an adjunct professor at the University of California-Berkeley. In 2016, she was involved in two pro-Clinton super PACs, Priorities USA Action and Correct the Record. She was named to Clinton’s presidential transition team in August. The U.S. Senate held its first confirmation hearings for President-elect Donald Trump’s cabinet on Tuesday. The hearing for Trump’s attorney general pick, Alabama Sen. Jeff Sessions, began in the morning, with the hearing for Gen. John Kelly as secretary of homeland security scheduled for Tuesday afternoon. Trump’s pick for secretary of education, Betsy DeVos, has been challenged by school choice opponents in the media and elsewhere. The confirmation hearing for DeVos was scheduled for Wednesday but was then postponed until Jan. 17.